Boil spinach until it is wilted. It should only take a few minutes. 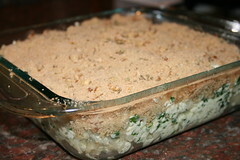 Then drain the spinach and set it aside. If you like, you can reserve the water for reuse in cooking the ziti. according to the package's directions. stirring well. 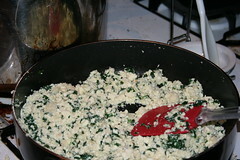 Try to break up all the spinach lumps so that it is evenly distributed throughout the tofu mixture. and stir until thoroughly combined. 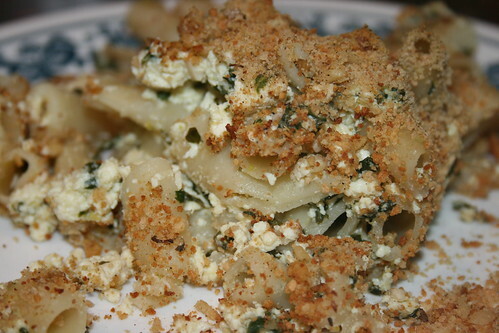 Spread the ziti-spinach-tofu mixture evenly into an 8x8 pan. and stir until mixed. 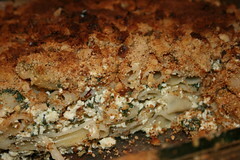 Evenly distribute breadcrumb mixture onto surface of ziti. Bake at 375 degrees Fahrenheit for 25 minutes. Cool for 10 minutes before serving. Note: I didn't cover the casserole with aluminum foil and the topping got slightly burnt. So covering it with foil is probably a good idea. Verdict: I loved this. However, I think I could have juiced the whole lemon without negatively affecting the flavor. I also should have put way more basil into the mixture. Add liquid ingredients to dry ingredients and whisk together until "just mixed." Prepare according to waffle-iron instructions. 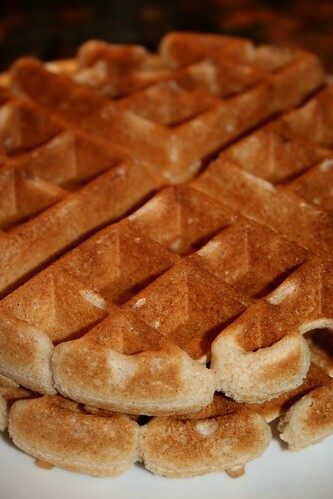 This recipe made four Belgian waffles in my waffle iron. 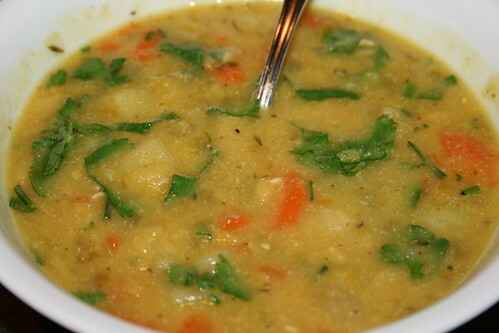 Honestly, you can just take your favorite split-pea soup recipe and sneak in some okara. You might have to amp up the seasonings a bit to make up for any dilution in flavor caused by the addition of okara. But for the record, here is the recipe that I came up with. Also, split-pea soup goes great with corn muffins!